While working on a ATtiny13 development board I noticed that my board only worked when the PB5 pin was high. If you have a non-functional or erratic ATtiny13 or similar Atmel MCU that shares RESET with a IO pin, try setting the IO pin that is shared with RESET to a logic high. It is possible that the RESET pin is being pulled low and this is keeping your code from running. This happens because instead of allowing for a software switch, Atmel uses the RSTDISBL fuse to control the switching between RESET and IO pin use. 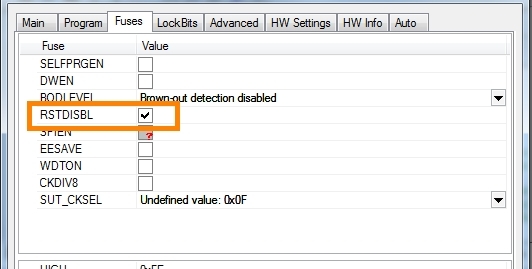 the ability to lock out the ability to reprogram the microcontroller!